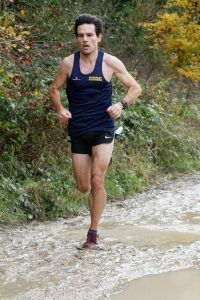 I ran cross-country at school, loved it and was fairly good. Unfortunately when I turned 14 and there were just three of us left doing running, and one of them had put it down on the form as an accident, so the school stopped offering it as an option and I had to do .22 shooting instead. That’s when my career as a fat child started. A disastrous first marathon in my early 20s involving a burst appendix (I finished the run but was in hospital the next day) rather put me off until around 5 years ago. It’s a very efficient way to stay active and sane. I mostly work from home and if I don’t get out and run I will go stir-crazy not moving all day. 30 minutes of running puts everything right again. Probably getting 2nd place at the Guernsey Half a couple of years ago. There were three of us running behind the pace car until the last km. The whole thing was written up in a breathless full-page report in the local paper the next day (not much happens in Guernsey, it seems) and I got a decent cash prize. Plus the guy who won had been an Olympian, so I didn’t feel too bad not taking top step on the podium. The 1908 London Olympics Marathon. It was full of drama (look it up!) and if I could be allowed to bring back decent gear and some gels, I reckon I could be in with a shot of a gold medal as the winner finished in 2:55 after the first finisher was disqualified. Run slower. Save the speed for a couple of harder efforts each week and enjoy the gentle stuff. A couple of spring marathons and then it’s time for some serious hills: three of us are going to do a four day stage race in the Alps. A marathon distance with up to 3,000m of ascent each day.